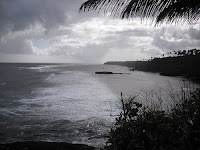 After Palmyra, my sailing journey took me to Samoa. I had intended to write a "Postcard from Samoa," similar to my prior post from my trip. 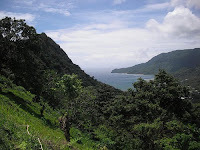 Sadly, Tuesday's 8.0 earthquake and subsequent tsunami relegated the Samoa I saw to a memory not only for me, but for residents there as well. 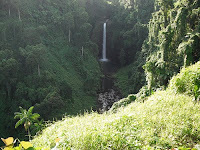 The Samoa I experienced was beautiful and indeed seemed very fragile. The capital, Apia, is hardly an urban epicenter, though vibrant, bustling, and safe. Not even the police carry guns. Outside the city, Samoans largely live in villages made up of traditional fale, thatch-roofed houses. Some villages have a small sundry store; all seemed to have a church. People live on "family land" -- community land which has been in the same family for generations, as foreigners are restricted to leasing property. They cultiva te taro patches in their yards that are planted next to mausoleums where their ancestors rest. They grow banana and coconut trees, and raise chickens and the occasional cow. If they live near the sea, they fish. They earn some money charging tourists nominal fees to enter their property to see various natural features, like the waterfall shown in the upper left. Many depend on their relatives that have scattered around the world for remittances. In the countryside there was nothing besides these villages -- no development, construction, or any protection from the sea which lurked only a few meters from individual homes. I remember driving along a coastal road on the East side of the island and asking my dear family friend, Time (pronounced ti-may) Sumeo, about the last hurricane and the aftermath. It felt fragile, and indeed, it was. As of this writing, the Associated Press is reporting 120 deaths in Samoa. The numbers, and the photos, hit close to home. Nick, Constellation's captain, Time, and I spent spent a Sunday afternoon at the beach village and tourist hotel seen in the picture at left. A woman from the village kindly shared a fantastic traditional Samoan Sunday lunch. Then we spent the afternoon swimming and snoozing in the shade of the many coconut trees that lined the beach. 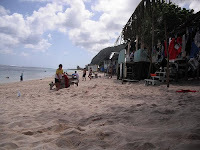 I heard from Nick, who is still in Samoa, that he and Time drove by the lovely beach fales. They, and the accompanying village were demolished. The woman who welcomed us was injured and is hospitalized. Even more personal, Nick's parents, John and Robyn Jaffe, flew up from Australia to visit him during their holidays. We spent a few lovely days on the southern part of the island at a tourist hotel known as Virgin Cove. It was made up of small fales situated only meters from the beach, and boasted a delicious dining room, staffed by the exceptionally musically talented people from the nearby village. Nick was on his boat in Apia when the tsunami hit. But his parents were still at Virgin Cove, and underwent a terrifying ordeal. Thankfully, they are safe, and are interviewed here. Most in the area weren't so lucky; there's nothing left of Virgin Cove, and most of the dead seem to be from nearby villages. In the coming days and weeks, aid workers will flock to the region to provide much needed assistance. Nick stayed and is volunteering his time. I wish that I could too. But for those of us that are too far, very basic supply donations are needed, and can be sent to a variety of places, including Help Samoa, a disaster relief coalition. 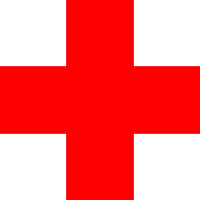 The American Red Cross is only assisting in American Samoa, where help is also badly needed. The New Zealand Red Cross is taking donations to provide relief for those living in Samoa. In Samoa I was shown great kindness by friends and strangers alike. Let's show Samoa the kindness of the world.